Fujifilm has this morning released official details of its new premium-level compact, the X-S1, and confirmed it will go on sale in February 2012. 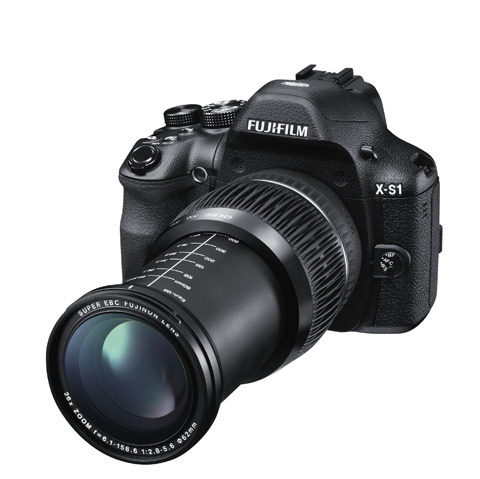 Touted as a ?new breed of bridge camera?, to rival a ?fully-manual DSLR?, the Fujifilm X-S1 sports a 26x optical zoom designed to deliver the 35mm viewing angle equivalent of a 24-624mm lens. A digital zoom will bolster overall zoom power to a 52x focal length range of 24-1248mm, according to Fuji. The 17-elements-in-12 groups (nine blades) lens includes four aspherical elements and two ED lenses. Fuji claims photographers will be able to focus down to 1cm, using the camera’s Super Macro Mode. The X-S1 borrows its 12-million-pixel 2/3in EXR CMOS imaging sensor from the Fujifilm X10 and boasts a minimum shutter lag of 0.01sec, plus a burst rate of seven frames per second at full resolution. Armoury also includes a Full HD (1920×1080 pixels) movie option and a hotshoe. A built-in EVF carries a screen resolution of 1.44 million pixels (viewing angle 26 degrees), and a 3in LCD monitor (460,000 pixels) that is tiltable, says Fuji. The X-S1 has a maximum equivalent ISO sensitivity of 12,800 (small JPEG format only). Controls include manual exposure, while colour, sharpness and tone can be ?fine-tuned?, adds the firm. Also on board are four auto bracketing options, eight Film Simulation modes, plus raw format shooting. Creative options include 360 degree Motion Panorama. The X-S1 is due to land on the UK high street priced £699.